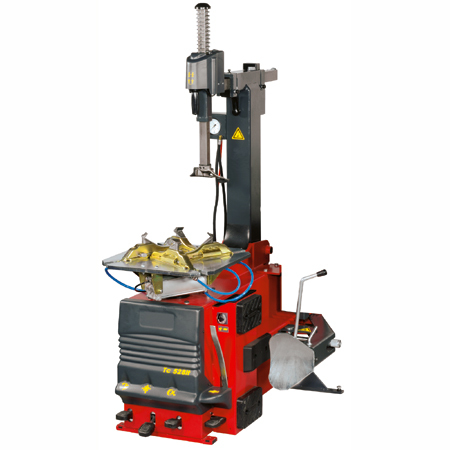 Tire Changers & Wheel Balancers | Sayco/Canbuilt Mfg. 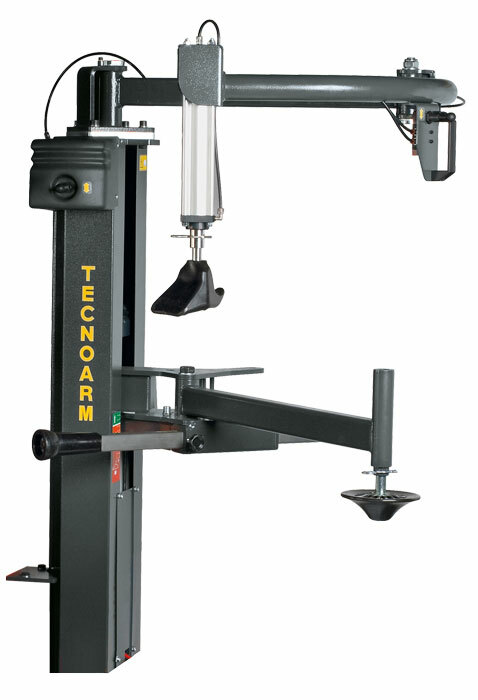 Powerful and practical, the TC-0325IT is designed for regular garages or tire specialists with large work volume. 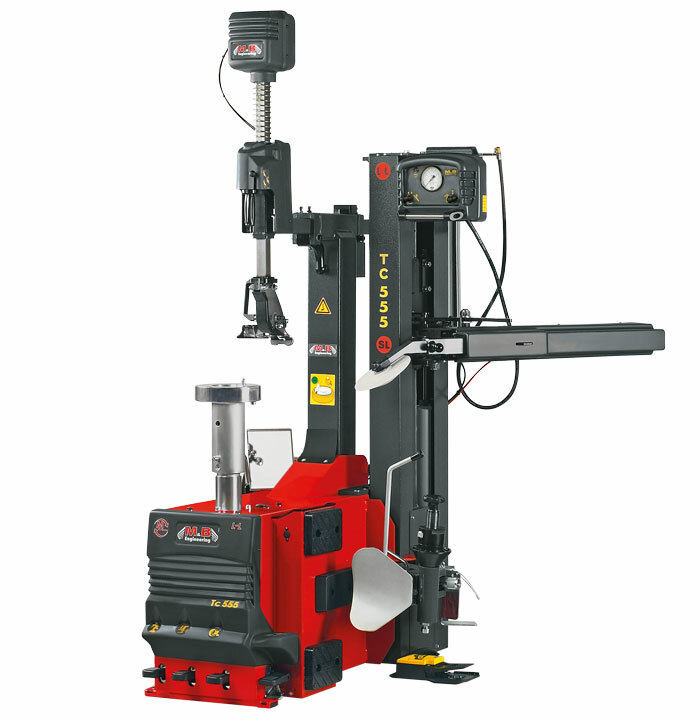 It can handle every tire application available in today’s market. Its built tough and can handle high impact forces when working with wide and low profile tires. The swing arm style is best suited for those with limited working space. Wheel width: - 3" - 15"
Rim diameter: - (clamped internally) 12" - 22"
Rim diameter: - (clamped externally) 14" - 25"
Wheel width 3" - 15"
(locked internally) 12" - 31"
(locked externally) 10" - 28"
Model # TC-0300TS See photo right. 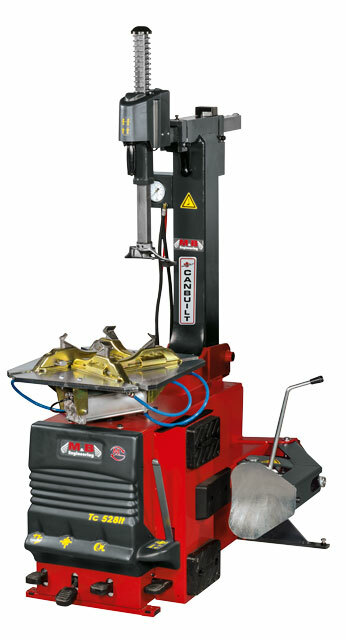 New generation of machines designed to perform all mounting and demounting of all tire types available on the market. The optional Techno Arm and Helper Group Model # TC-0520TA is highly recommended for dealing with UHP and Run Flat – RSC tires. 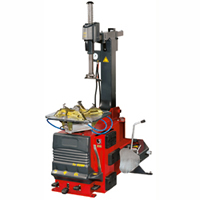 This machine offers solid power, speed and control for the busy professional tire shop. 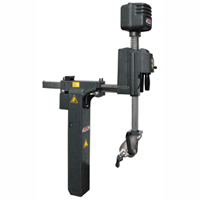 Wheel width 3" - 16"
(locked internally) 12" - 22"
(locked externally) 14" - 25"
The TC-0528IT is an automatic tire changer particularly suited to working on large sized and large diameter wheels. The tilt back column design allows setup for multiple mount an demount of same size tires. In addition, the "L-L" option can be added to this model series to provide the solution to mounting and demounting heavy wall or low profile performance tires in an automatic mode. 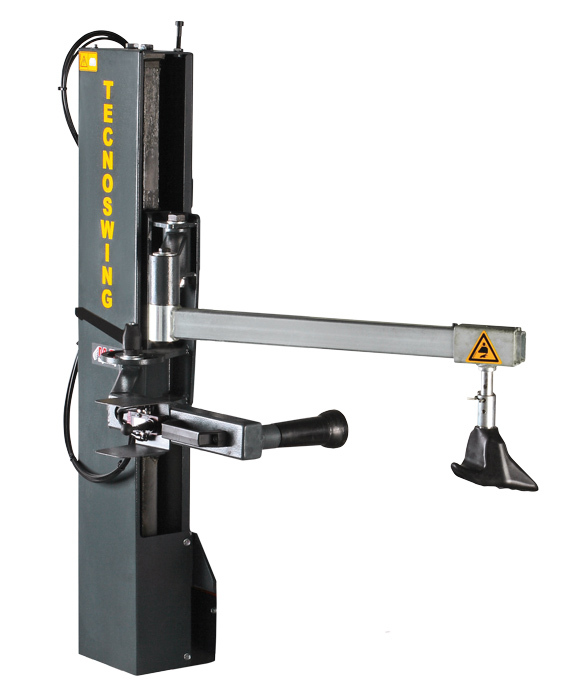 Also included on the TC-0528IT is the special 4 position bead-breaker and the 4 innovative design locking jaws that provide a clamping range from 10" to 28" outside clamping and from 12" to 31" inside clamping. A 50% more powerful turntable motor, provides the "grunt" required for many of those tough jobs. Max wheel diameter: - 46"
Rim diameter (clamped internally) 12" - 31"
Rim diameter (clamped externally) 10" - 28"
Bead Breaker Opening: - 17"
This tire changer represents a new generation of machines designed to perform all mounting and demounting of all tire types available on the market. Thus addressing the difficulties from constant changes in the tire and wheel industry. For example the special consideration when dealing with UHP and Run Flat – RSC tires. (locked externally) 10" - 28 "
This helping device was developed to simplify and optimize the demounting and mounting procedure for the operator. Its great ergonomics and ease of use, specially when working on performance and low profile tires makes it a MUST-HAVE device. An indispensable device for working on particularly hard and large-sized wide and low profile tires (EMT, RFT, CRS, DSST, etc.). The tough structure is designed with an air cylinder that is not subject to deflection during heavy work operations. Easily fitted on all TC-0322IT and TC-0328IT model machines, which are pre-designed for the application. Positions and holds the rim during the locking operation. Maintains the tire bead in the rim well, facilitating extraction. Allows the bead to be held in the rim well during mounting. Roller arm has the ability to operate under the tire. This machine features a dual bead breaker. One is traditional adjustable blade style at the side of the machine and a disc roller on the arm. It also includes a helper group arm for mounting UHP, run-flats and low profile tires. The adustable centre post allows working with wheels of different off sets, and a the built in wheel lift to increases efficiency and safety for the operator. Designed to work on high end tires and rims, where quality trumps speed. 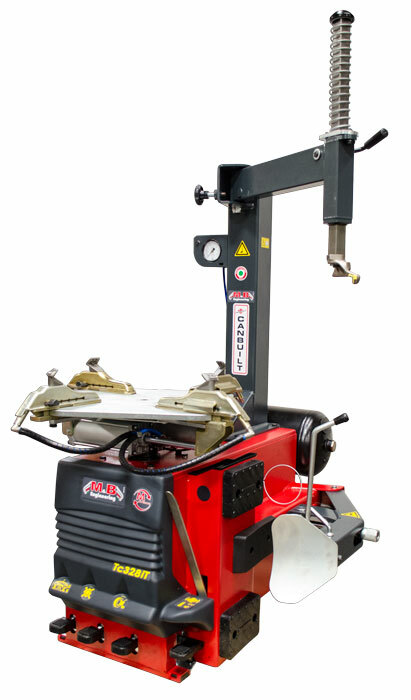 This machine uses coated and strong plastic tools to protect those expensive aluminum and alloy tires on top end cars. Engineered for working with oversized, run-flat, low profile, and performance applications. 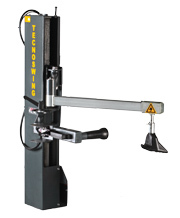 The TC-5000 comes with a wheel lift that faces a movable and adjustable chuck. When the wheel is tipped and positioned horizontally the rim hole, it is always aligned with the centre of the chuck. This ensures quick and efficient handling for heavy wheels. 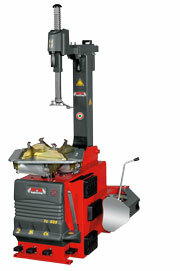 Bead breaking is achieved with the combination of two roller arms and the rotation of the chuck. 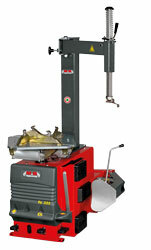 The two rollers are also used for mounting and demounting tires. A second arm is provided to simplify fitting operations (essential for large diameter wheels). There is also a third pressure point (mobile arm helper) which follows the rotation of the tire. The mirror positioned opposite the operator provides an easy and practical way to monitor all the operations conducted under the tire. The movable chuck is a totally new concept and includes an easy-to-use fixing pin. It has two height positions, which is essential when working on large sized reversed-well rims. The demount-mount tool in precision cast steel. It is completely coated with a special plastic material in order to avoid any damage in the case of contact with aluminum rims. 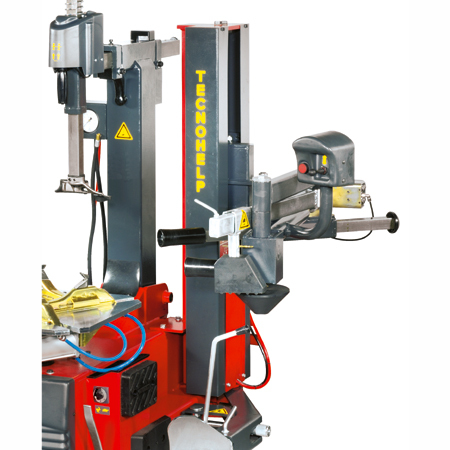 It operates on the same axis as the chuck and enables the operator to constantly control its correct position and avoid errors. The control panel is designed and constructed on ergonomic principles. All movements are activated with a single hand. The position of pedals and manual controls are conveniently located to maximize comfort and functionality for the operator. A Helper tool that is indispensible in dealing with wide and low profile tires (EMT, RFT, CRS, DSST, etc) as well as particularly hard or large sized tires. The tough structure is designed with 2 air cylinders and does not allow flexing during the hardest working operations. Easy to fit on all TC-500 Series machines as they have been designed to accomodate this option. Helps position the wheel during the locking operation. Fixed arm has a graduated gauge to assist operators during the positioning and control of the arm. The movable arm makes it possible to keep the bead pushed into the rim-well during mounting. An additional bead pushing device fitted with the TechnoHelp assists during the mounting and demounting of the 1st bead. It is particularly suited to tires and rims of large diameters and sizes. 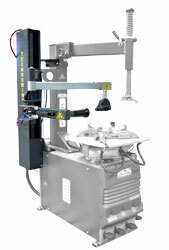 The Optional "L-L" (Lift Lever) is an M&B patented solution to reduce the physical work of the operator and the job speed. 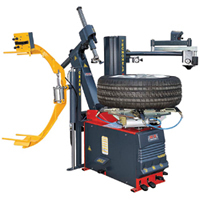 The L-L system makes a tire changer truly Automatic. It revolutionises the concept of work on tires and wheels in general and works on all types of the latest generation wheels: run-flat, low profile and large sizes, with no risk of damaging rims and tires. Consisting of an air operated automatic De-mount head with automatic bead lifting lever, it solves the problems of lifting the bead on difficult tires like run flat and low profile. Easily and quickly facilitates the de-mounting of difficult beads. 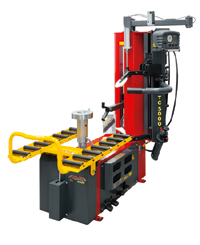 The L-L system can be used on the TC-500 Series of automatic tire changers (TC-0522 and TC-0528) without changing the basic features of the machine. For tires to 36 inches in diameter and weighing up to 175 lbs, a welcome, optional addition to take the "Grunt" and repetative lifting out of the job. Designed to:- increase production, save time and reduce work place injury. © 2001-2019 Sayco Distributors Ltd.